Another action packed issue of Grifter comes and goes but this time the contender of the moment is Midnighter of Stormwatch. Fans of the old Wildstorm Universe known that the last time these two characters met, it did not end well. While it is a fun encounter and it was handled well, we still have yet to learn more about Grifter. I think I’ll start with Scott Clark’s art this time. Some people have really been split on his art but I really felt it was stronger here. I don’t know if it’s the fact that the setting was in the snow but it just didn’t seem as ink heavy as it has the last few issues. I love seeing Scott Clark’s rendition of Grifter. There’s just something about the way he draws Grifter that is very definitive for the character. 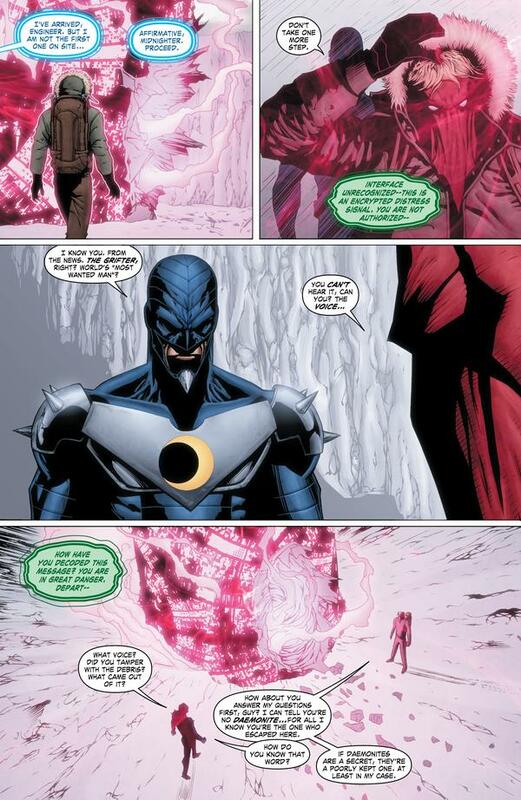 He also does a decent Midnighter and I loved how he did certain shots where Midnighter was mostly in shadow but his symbol was visible. It was a nice effect. What is getting to me about this title is we’re not learning anything new about Grifter. The funny thing is it seems to have started when Scott Clark came on the title. I’m not sure if Edmondson ramped up the action in the title because of Clark because action is definitely Clark’s strong point. I have enjoyed Scott Clark’s action scenes but it seems that we lost a lot of the story-telling from the early issues. Based on the conversations Grifter had with his brother in the early issues, we know that Grifter is ex-special forces. Old Wildstorm readers know that in the WSU it was Team 7 he was a part of (which was an idea used in Lois Lane and the Resistance during Flashpoint). Now I wasn’t 100% expecting that Edmondson would use that during his run, but at the very least I was hoping for some flashbacks to this time in Grifter’s life. I just want a little more substance from this title and I think after 7 issues, I’ve given it more than enough time to deliver that. I am still enjoying the Grifter title, but I’m actually ready for something new with the character. Edmondson does leave us on a couple of interesting notes as Grifter comes up with a new plan to stop the Daemonites which sounded interesting. However, with Edmondson only having one issue left I’m not if it’s an idea that will carry over into Leifeld’s upcoming run. I will end with one great thing about the issue (and this is not a spoiler since it’s on the cover of the next two Superman issues). We get to see Clark’s rendition of Helspont and his arrival in the DCU! It’s a nice lead in to Superman #7 and I can’t wait to pick it up! 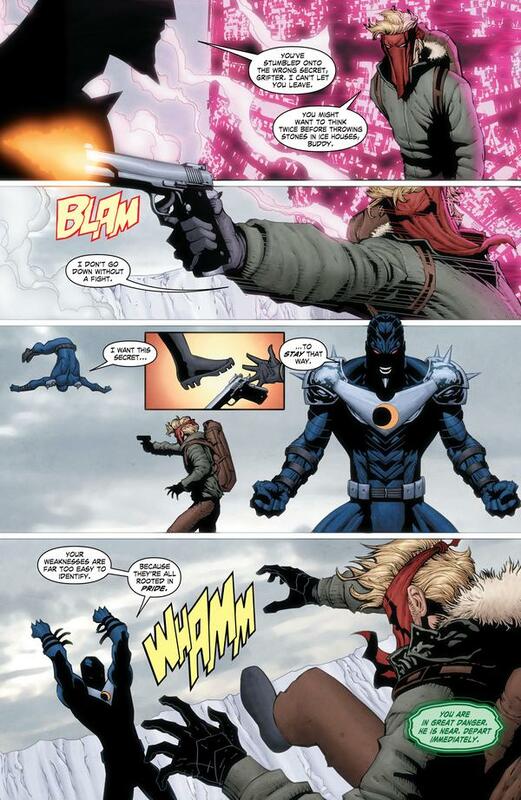 This entry was posted in DCU, Grifter, Reviews and tagged grifter, midnighter, Nathan Edmondson, scott clark. Bookmark the permalink.